So, confession time: Peter Pan was my first ever literary crush. Even though at the time I didn't even know what a crush was. I was 4. Or maybe 5? 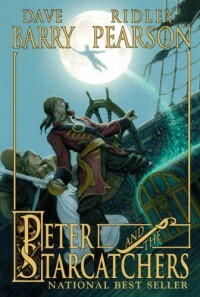 The point being: I LOVE Peter Pan. And this book had been on my to-read list for some time now, even though I hadn't yet managed to get my hands on a copy. So when it showed up on NetGalley, you better believe I clicked that button in under 1.5 seconds! This book is pretty big for a children's book, 478 pages in my eversion. But it flies by! Really, I blinked and then I'd read another 15 pages. And I enjoyed every minute of it. I really liked Molly and LOVED Ammm the porpoise. 'Molly green teeth' cracked me up every time. Best. Greeting. EVER. My mom was looking at me funny when I snorted yet again. I think I'm gonna go watch the Disney movie now :) I have it on DVD, hurray!